Our range of glass dining tables are designed to make a style statement in your dining room and allow the natural beauty of the solid oak legs to shine. Make your home dining experience a little more refined with a beautiful glass dining table. Designed to let light in and add a sheen of sophistication to a dining area, a glass dining table not only looks fantastic, but can work hard to make more modestly sized dining areas seem bigger. Featuring robust 10mm thick glass you can rely on, they also allow you to show off the natural beauty and grace of the solid oak legs. For those looking for a glass table that bridges modern and classic styles, these tables are the perfect dining room addition. We have finished the legs in both natural oak wax and our popular rustic oak finish so that you can find a look to seamlessly blend into your dining room. 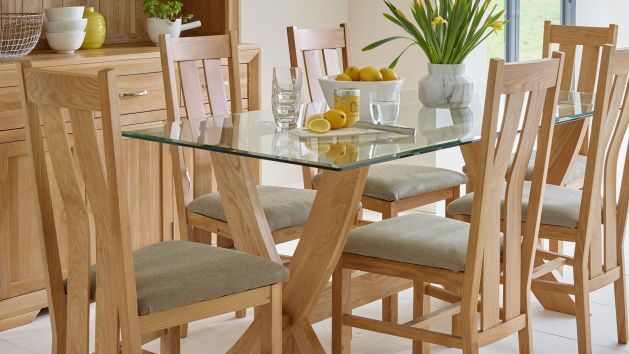 We’re all about quality at Oak Furnitureland, which is why each of our glass dining tables is built using only the very best cuts of solid oak to support our crystal-clear glass. Selected for their superior golden colour and grain pattern, they can withstand the test of time, unlike tables built using veneers, MDF or other inferior materials. – which allows you to show off a group of perfectly paired dining chairs through the clear table top. The versatility of our glass top dining tables gives you the freedom to pick whichever style of dining chair you choose. You could go for a charcoal fabric scroll back dining chair that works well to give your dining space an air of modern sophistication with its luxurious upholstery. We also have a range of genuine leather dining chairs that boast a contemporary feel. If your dining area has a more earthy, natural vibe, then our stunning woven grass dining chairs with natural mango wood will complement the space perfectly. Our painted dining chairs look fantastic in both modern and traditional dining rooms. Can’t decide? Our dining set builder is designed to provide you with style inspiration so you walk away with a dining set that perfectly complements your home. For your convenience, every purchase from Oak Furniture Land instantly qualifies for free standard home delivery. We promise to deliver your new furniture to the room of your choice, and will even give you a courtesy call 30 minutes before arrival. If you need your items a little faster, then our express delivery service costs a little extra and allows you to receive your furniture within seven days.